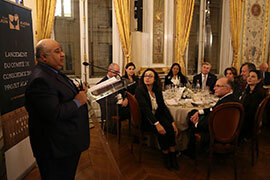 UNESCO partner organization the Aladdin Project hosted a dinner for eighty high-level French and international personalities at the American Embassy’s historic building, Hotel de Talleyrand, on Monday, November 27, 2017, to discuss the relationship between the Arab world and Europe, and the future of intercultural relations. Sheikh Mohamed bin Issa Al Jaber, Chairman of the MBI Al Jaber Foundation, speaks at the Aladdin Project dinner. The keynote speakers at the event were Bernard Cazeneuve, former Premier minister of France, and His Excellency Sheikh Mohamed bin Issa Al Jaber, Chairman of the MBI Al Jaber Foundation, from Saudi Arabia. 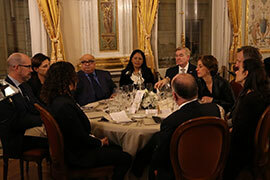 Other speakers included former UNESCO Director General Irina Bokova, former French Foreign Ministers Hervé de Charrette and Bernard Kouchner, former French Minister of Education Najat Vallaud-Belkacem, as well as the American Ambassador to France. The invitations were from Baron Eric de Rothschild, Leah Pisar, former head of communication of President Bill Clinton, Andre Azoulay, Advisor to the King of Morocco, and Bariza Khiari, advisor to President Emanuel Macron. Benjamin Stora, President of the City of Immigration and presidential advisor on immigration, and Guillaume Denoix de Saint Marc, President of the Association of French Victims of Terrorism, also attended the meeting. Several members of the French Academy and Emmanuel Bonne, Chief of Staff of the French Minister of Foreign Affairs, as well as the Ambassadors of Israel, Morocco, Egypt, Jordan, Turkey, Belgium, Italy, the European Union, Bahrain, Iraq and Azerbaijan were present at the meeting. The President of the French umbrella Jewish organization and the heads of major Jewish institutions in France and the President of the Conference of European Rabbis, and heads of the main French Muslim organizations were also present. Renaud Girard, international editor of le Figaro newspaper, moderated the discussion. “As a proud Saudi citizen and an Arab, I can say that what is happening today in Saudi Arabia is like a dream for me that has come true. I came to the conclusion long ago that our biggest problem and challenge was corruption. We simply could not enter the modern era if we had this level of corruption. Close to 60 percent of Saudis don’t own their homes, because the Ministry of Housing cannot find the land to build homes for them. All the land had been taken by a corrupt clique. What Crown Prince Mohammed bin Salman is doing today is an absolute necessity. All Saudi citizens support his efforts to clean the house. He is a courageous leader and we should all support his efforts. The Crown Prince has been very courageous in rejecting the extremists and trying to restore religion as a tolerant and moderate force in Saudi society. These changes are important, because Saudi Arabia holds the key to change in Sunni Islam across the world.